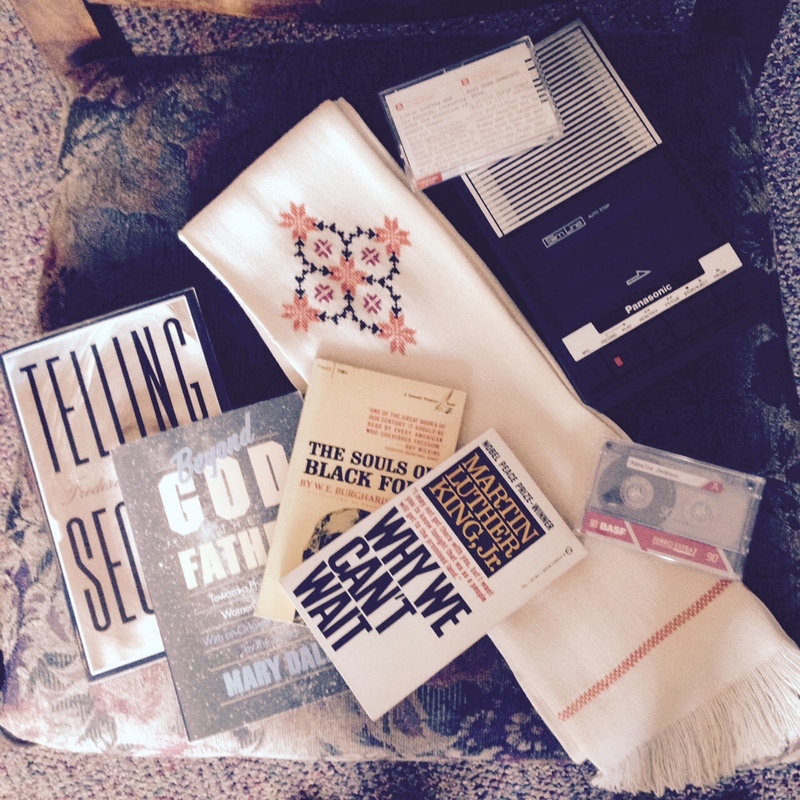 The cassette player and the tapes came from the second visit, the one with the elderly member of my church. We have had our ups and downs; we haven’t always seen eye-to-eye, but a couple of weeks ago over coffee after worship we stumbled into a conversation about music. It was difficult finding common ground in that conversation with 60 years separating us in age, but we did – – over ukulele music. My husband gave me a ukulele for my birthday in January, and I’ve been trying to learn to play it through YouTube videos and iPhone apps. Roger told me about his favorite ukulele player, Arthur Godfrey, from the 1940s and 50s and promised to bring me some tapes to listen to someday. I told him he better bring me a tape player, too, which he did. He brought cassettes, a tape player, and plenty of stories – stories about college, stories about his wife, stories about visiting the White House and meeting Eleanor Roosevelt. I couldn’t help but realize as he told me the stories with the music playing in the background that this little black zipper case he lent me is the soundtrack to the part of his life that only he can remember. As I listen to these 7+ hours of music over the next few days I’m going to listen for more of his stories. The colleague I visited earlier in the day was one I had never actually met, which is embarrassing to admit since we have worked only 10 miles away from each other for 7.5 years. It also turns out that the suburban Maryland church he served in the middle of his career was the church I served as an intern a year before I started mine. The end of his service there was just 5 years before I arrived in the summer of 2001. We had each lived with the same family when we first arrived in town. Small world. While we sat together for a small slice of the afternoon he told me stories of his ministries in 4 different congregations over 30 years. Then he took me on a tour of his bookshelves, telling me where I could find books on different topics to help my ministry. I’ll be honest; there wasn’t a lot there that looked too helpful to me. Some, but not a whole lot. I took a few titles that I had never gotten around to adding into my own library. I found a couple of historical gems. Before I left he gave me one of his stoles, a white one, that he doesn’t anticipate using much anymore. But really this visit wasn’t about the material things he was passing on to me. It was about the stories. It was about marking the span of a ministry and sharing about that ministry with someone who still has most of hers ahead of her. It was about acknowledging that his life would be dramatically different in 7 weeks, and not too many other people get that except other pastors, even other pastors at the other end of the career spectrum. In fact, his last Sunday as the pastor of his church will be the first Sunday of my sabbatical. We both spoke out loud at the same time the thing that we were looking forward to this summer – – weekends. At the end of the story-telling and book picking and stole-gifting, I thanked him for reaching out to me. He thanked me for listening to his stories. I also invited him to drive down the road when he needed a place to worship. Our doors would be open, and I’d be glad to welcome him – – in mid-September when I get back from rediscovering weekends that is.